Gooding and Company will be offering a total of 131 automobile lots, over two days, at their upcoming auction in Scottsdale, Arizona – January 19th and 20th. 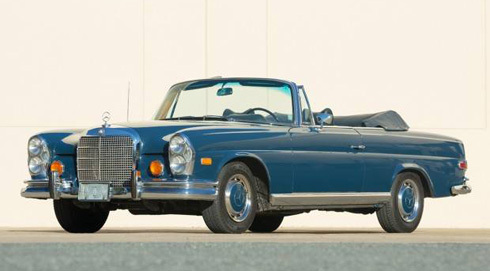 There are 13 Mercedes-Benz that will appear at the Gooding and Co. sale, 7 on Friday and 6 on Saturday. 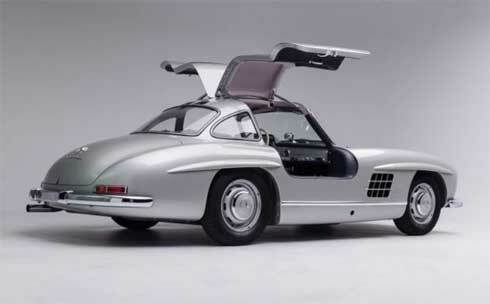 This article is a preview of the 7 Mercedes-Benz cars being auctioned on the first day of the sale. Click here to visit my write up of the cars being offered on day 2, Saturday, January 20th. No less than five 300 SLs will be offered over the two days of the Gooding sale. 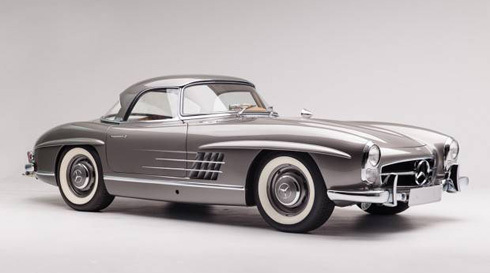 I take this as a sign that 300 SL owners have accepted the mild pull-back on prices since the high tide of 2014 and 2015 and are ready to sell their cars in the ‘new normal’ range of $1 – $1.5 Million. Remember, there were just three 300 SLs offered during Arizona auction week last year, and that’s across all the auction companies, two at Gooding and Co., one at RM… none at Barrett-Jackson or any other auction company. 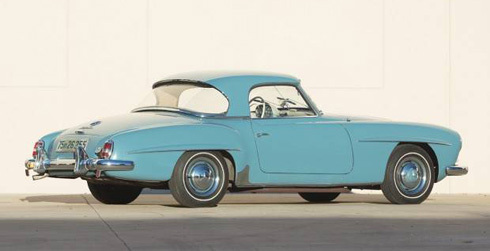 In addition to the ‘blue chip’ 300 SLs Gooding will be offering two 190 SLs, three Pagoda SLs, a 280 SE convertible, a 280 SE 3.5 coupe, originally owned by Ed Sullivan, and a handsome 300 SEL 6.3. It’s a nice mix of collectible Mercedes and as you would expect from Gooding and Co., it includes restored and original cars, cars with interesting provenance, concours ready show cars and drivers. The Mercedes offerings from the first day of the Gooding and Co. sale are laid out below with my commentary on each car in italics. Full details about the auction location, date, time and admission information is included at the very bottom. I’ve done something new here, which I might regret, but it’s what I do while sitting at the auction with friends… guess what the cars will actually sell for. My guesses are at the end of each car’s commentary. 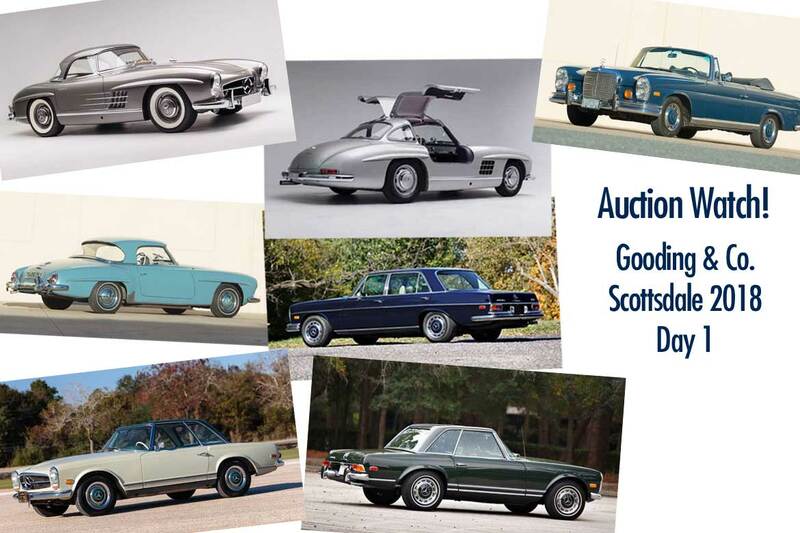 View Gooding and Company’s complete online auction catalog for Scottsdale 2018 here to see ALL the cars being offered. A color changed car that’s had its fair share of owners across three continents, well documented once it arrived in the United States. A Hjeltness restoration is always a good thing, even if undertaken 20+ years ago. While it is a color change, the colors that it wears today are about as good as it gets. Without having see the car in person, the estimate looks reasonable for, what I would call, a run of the mill 300 SL – as ridiculous as that sounds, is any 300 SL ‘run of the mill’? From a strict collector car standpoint, this one is. Restored by a well respected shop, broken in and mellowed since, in great colors, even if not the original combo… at a Gooding and Co. auction… I think this one will do well… selling at $1,200,000. 53 years in the same family – from new until the daughter of the original owner contracted Paul Russell and Company to assist in the car’s sale in 2014. New owner / consignor shipped the car to Poland for complete restoration at Almar in Kaczory, Poland – restoration completed 2017. Originally White with black leather, color changed to Anthracite exterior with beige leather interior during restoration in Poland. Odometer showed approximately 77,000 miles when acquired by consignor in 2014. Now shows less than 250 miles (since restoration). Another color change 300 SL, a Roadster this time. The 300 SL roadster with a hard top fitted must be one of the best looking cars ever made, absolutely fabulous. Great, documented single family ownership with this car. The consignor clearly bought the car with restoration and re-selling in mind. Many cars from the U.S. are being sent to eastern Europe for restoration, 300 SLs, 190 SLs, and I’ve been responsible for shipping quite a few W113 Pagodas to Europe that were destined for restoration in the East. They do fine work and at a cheaper labor rate than in Germany or the U.S. It’s a shame they strayed from the colors on the build card with this car. If it were a Hjeltness or Rudi and Co. restoration the estimate would be higher, but it should still have no problem surpassing the low estimate… how CAN’T a restored 300 SL not reach a million bucks? My guess…. this one will sell for $1,150,000. Restored over 16 years, finally completed in 2014, much restoration work completed by Bob Platz’s Precision Coachworks. Everyone needs a 4 door sedan in their collection, to pick up friends at the airport, to take 4 people to dinner, etc. There are few 4 door sedans cooler than the Mercedes-Benz 6.3. They require a lot of maintenance and they can help break the bank (even the biggest accounts) if neglected, but the driving experience is quite rewarding. The Bob Platz name is well respected, although we’d have to look into the restoration receipts in detail to see how much of the work was really done at Precision Coachworks to judge their involvement. 6.3s usually sell in the $60,000 – $80,000 range although Gooding and Co. did sell a 6.3 at their Amelia Island sale in 2017 for $126,500 that was said to have been restored in the early 1990s. I spoke with Neil Dubey at Star Motors in Endicott, NY regarding that car, as his shop had worked on it shortly before the sale. He described that car as ‘perfect’. I’ll be interested to see this car in person and see where it ends up when it crosses the block, as I’ve got a very, very nice 1971 6.3 currently for sale for $79,000. I actually contacted Gooding and Company a couple of months ago about consigning that car, but never got a response to my email inquiry… probably because I mentioned wanting to put a reserve on the car… and that just doesn’t work for the auction companies unless you’ve got a car expected too sell well into 6 figures. I’m going to bet this car sells in the $90,000 range. I call the 250 SL ‘the thinking man’s W113’ – many of the pure qualities of the 230 SL in terms of good looks (no head rests) with an improved engine. The 250 has a 7 main crankshaft as opposed to the 4 main on the 230 SL with just about as much horsepower as a 280 SL and a little less weight… yet, a lot less money than a comparable 280 SL in today’s market. 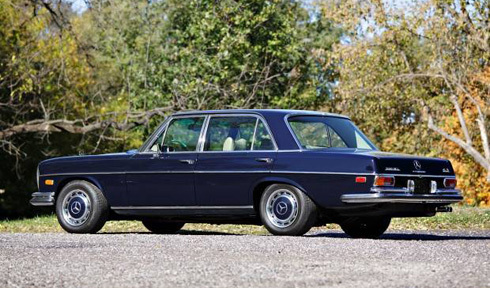 250s had the lowest production figures of the W113 series with just 5,196 produced. Unfortunately, for 250 SL owners, rarity doesn’t mean they’re more valuable, they’ve always trailed the 280 SL models in price. I love the color combination on this car, two tone cars in general are always interesting. This is an unusual, yet elegant, period combination with green interior. Points for the manual transmission and the fact that it’s never been restored. The ‘hard top only’ option really hurts though. While it is simply a ‘soft top delete’ car, meaning, it isn’t a California Coupe… so it does have the hinged toneau and soft top well, not the little parcel shelf thingy the CA coupe has, one could install a soft top in this car, but it would be expensive and kill the originality. The estimate from Gooding and Co. on this car seems overly ambitious. I think this one will sell in the neighborhood of $70,000. Consignor acquired car from the original owner (his estate – in 2017) upon original owner’s passing, essentially a one owner car. Original owner picked up the car in France when new and shipped it back to U.S. This is another car I’m really interested in seeing cross the block as I have a very similar car for sale… a 1962 190 SL: ‘one owner until 2012,’ picked up in Norway by its original American owner who toured around Europe before shipping it home, records and paperwork galore, original paint. 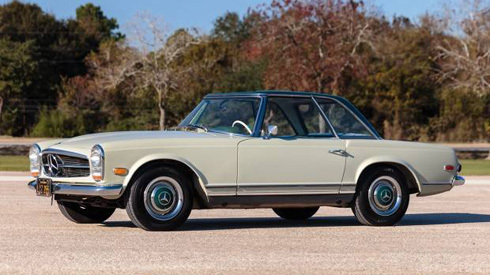 Cars this original don’t show up often and while the 190 SL market is saturated and very tough of late, I think there will be enough people in the Gooding and Co. crowd that value originality and the ‘preservation class’ nature of this car to push it to a decent sale price. I don’t think it will flirt with the auction estimate, but I think it will bring what I would consider healthy money for what it is in today’s market. I think it will sell for $125,000… well below the estimate, but someone will have valued originality over ‘just another shiny restoration’. A decent looking 280 SL with one long term owner from new, early paperwork and records showing maintenance and ‘gradual restoration’. 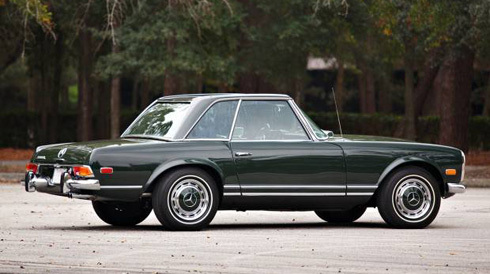 A fine story, but not enough in today’s Pagoda SL market to warrant a six figure selling price. The mileage is most likely 154,000, the car has been repainted, the interior has been replaced. In today’s market, even at a high end auction, I’ll be surprised if this 1969 model, with its automatic transmission, sells for much more than $85,000. With just under 1,400 examples built between 1967 and 1971 these are rare cars. All the 280 SEs are great drivers, sedan, coupe or convertible. They’re very usable, comfortable, reliable and better than just about anything else you could buy from the period. Values of the 6 cylinder convertibles have increased as their V8 counterparts went into the stratosphere. According to the auction catalog, this car has undergone “recent comprehensive maintenance” which included new engine and transmission mounts, driveshaft flex joints, new fuel-pump mounts, front shock absorbers, and a new battery. Those are all regular maintenance items that are perfectly normal for a car of this age. There is probably more to be done to this family jewel in the near future, but at least you know those things have been taken care of. Without seeing the quality of the paint or the engine bay it’s hard to know where this car will end up when it crosses the block. It should surpass $100,000, but not by much. Click here to see my preview of the 6 Mercedes Gooding and Co. will be offering on the second day of their Scottsdale sale, Saturday, January 20, 2018. Gooding and Company has assembled an enviable collection of cars at this year’s event, day one looks pretty interesting in terms of Mercedes for sale, it should be fun to watch the action unfold. Everything you need to know about attending the auction is below. Source: Gooding and Co. – See more at the Gooding and Company website.